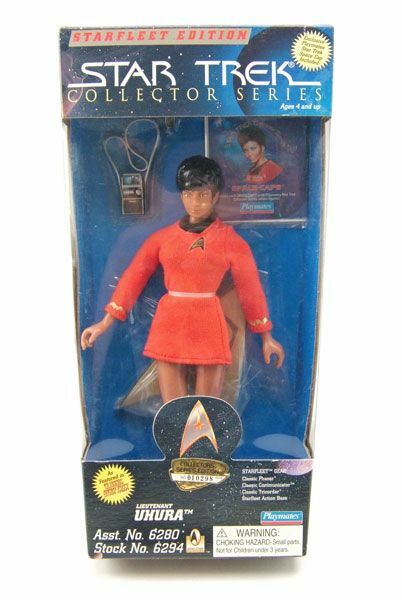 Playmates released this Uhura as part of the 9" Collector Series. The Rundown: At only 12 spotlights so far, I've barely scratched the surface in showing you what the Playmates 9" line has to offer. Sure, the bodies aren't super-articulated and the releases often relied on the "Kirk-in-a-different-outfit" syndrome... but the sheer number of figures produced is impressive enough to warrant giving this line a look if you haven't already. 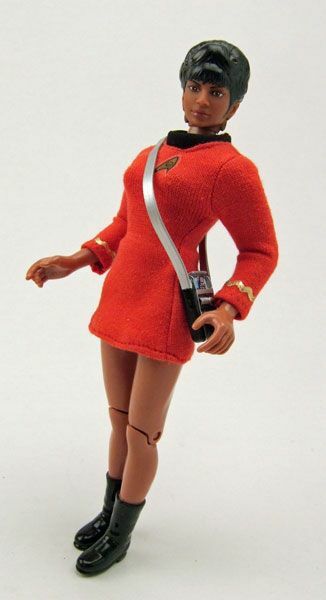 Today we are taking a look at one of the "must-haves" for those of you who may be dipping your toes into the 9" water- Lt. Uhura! 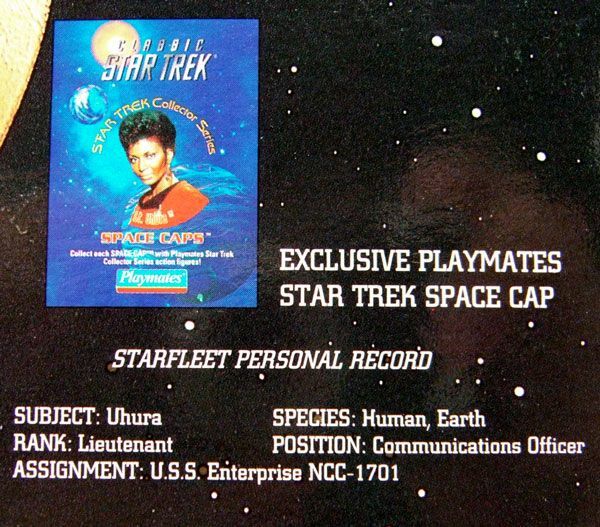 Uhura follows the same format as all the other releases in the 9" line. Playmates designed a male and female buck body, and then individualized each figure by adorning them with different head sculpts and outfits. 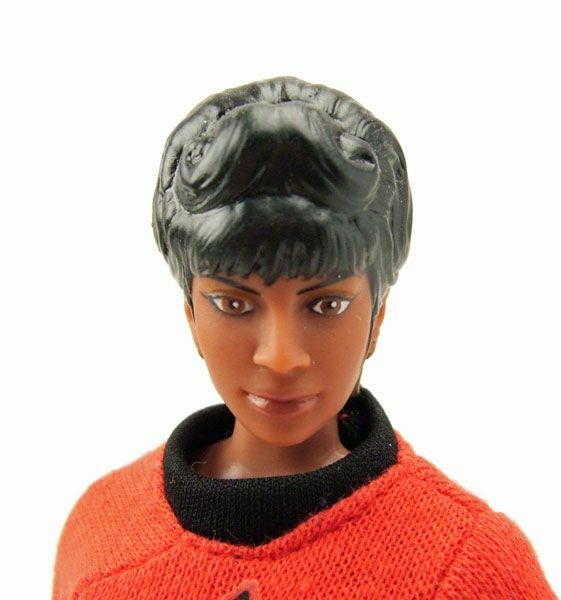 If a character was released in more than one outfit, they usually incorporated the same head sculpt across the board (like Uhura did with her 9" Mirror Universe counterpart). The heads used on the bodies can sometimes be pretty hit or miss. The larger size would seem to offer a more detailed sculpt, but the roto-cast process used to produce these heads could sometimes lead to a slightly warped or distorted shape. 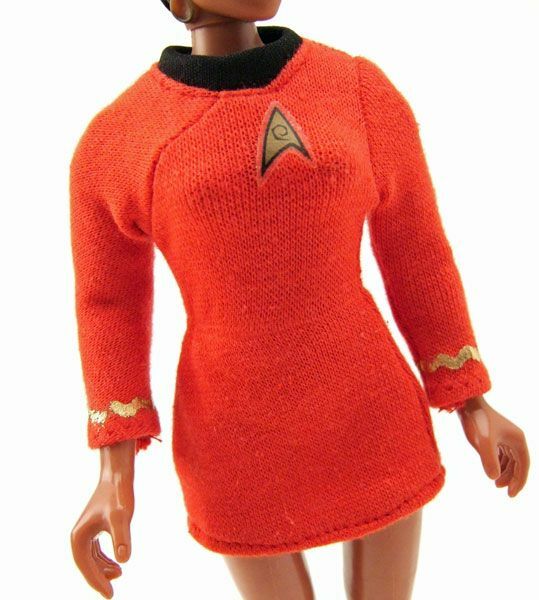 Uhura falls right in the middle for me. While I don't think her head is bad, I don't think it is particularly good either. The nose is captured well, but there's something about the shape of head that throws this one off just a bit. Playmates' 9" female buck body is decently articulated, but still has its limits. A swivel joint at the boot or wrist would have really improved the figure's poseability. But hey... these are mass-market toys from over 15 years ago. You can't go into this expecting a Hot Toys level of articulation. Ya gets what ya pay for! One thing I will say for the body though- She can hold her accessories! 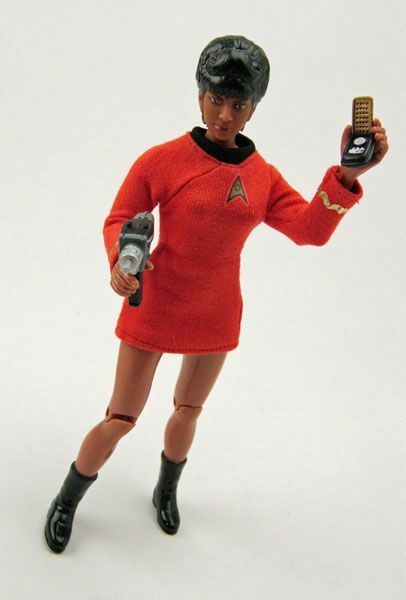 Unlike a lot of the 4.5" figures, Uhura here has no problem gripping her phaser and communicator. Which is important since you want to be able to send her out on a landing party every once in a blue moon. 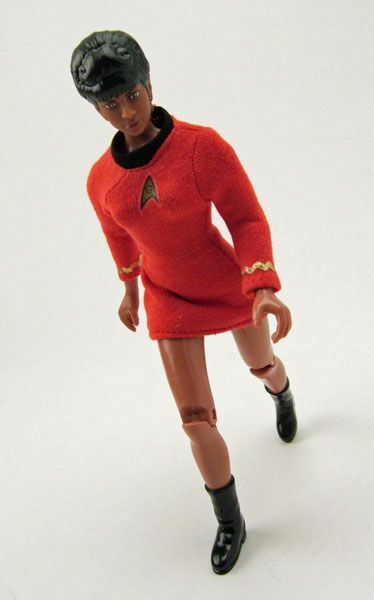 Poor Uhura... Always stuck at the communications station. While there wasn't much of an outfit to reproduce here, Playmates did do a nice job considering the cost and time at which this was made. The delta shield is a bit large, but other than that I don't have any major gripes with this one. Looking good Nyota! 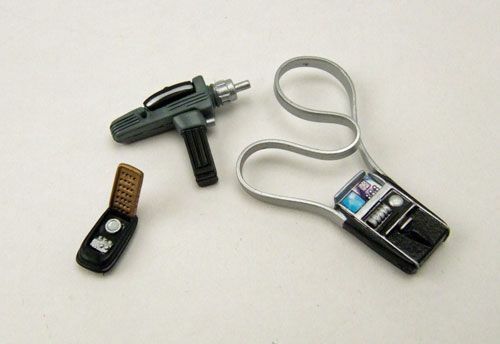 Accessories: Uhura includes a phaser, communicator, and tricorder. While the communicator and phaser are a bit large, the tricorder is actually pretty nice and well detailed... for a Playmates accessory that is. 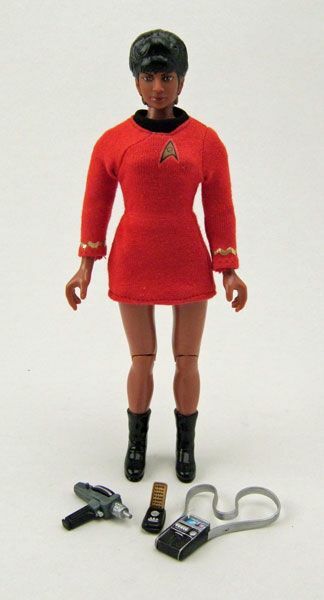 Overall, Uhura is a pretty average release for the 9" line, which may make her a good place to start. 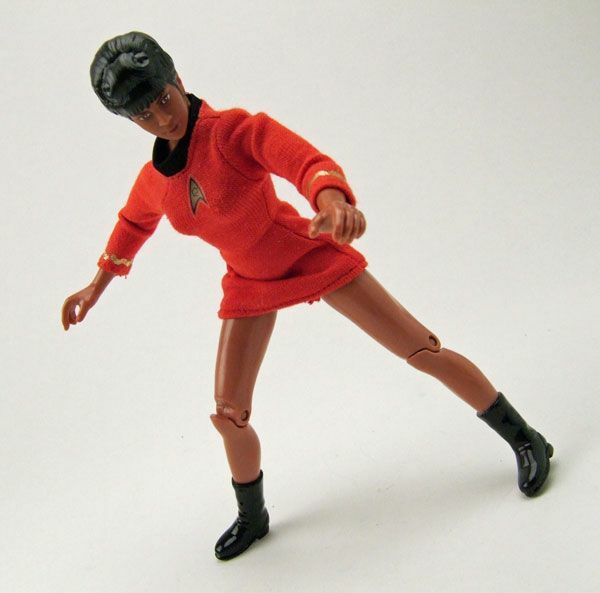 If you're building a full crew, you'll need Uhura... and her "averageness" may give you a good idea of what to expect with other figures. She routinely sells in the $6-$10 range, so you won't be breaking the bank if you decide to go after one. Besides... you're going to need somebody to open the hailing frequencies for all your other 9" figures. Man, do you KNOW me, or what! That truly made my day.